Reports of victory claims by the Indian Commander at Exercise Indradhanush lack in perspective, and miss some crucial details. Last month, Sukhoi Su30 MKI fighters from 2 Squadron of the Indian Air Force participated, along with Typhoon FGR4 jets of the Royal Air Force, in Exercise Indradhanush 2015. The 10-day exercise, held at the RAF base of Coningsby, has created a controversy over the results claimed by the IAF. In an interview to NDTV, the IAF Commander for the exercise, Group Captain Ashu Srivastav, said the performance of his pilots was “exceptional”. He also claimed his contingent scored a 12-0 victory against the RAF fighters in a series of aerial dogfight scenarios. This included one in which an Su-30 engaged two Typhoons, and the IAF fighter emerged winner, ‘shooting down’ both ‘enemy’ jets. So, what is the reality? Serving IAF fighter pilots say the claims were not exaggerated. The exercises were held in two different scenarios: Within Visual Range (WVR), where simulated missiles are fired up to a range of 2 miles, and Beyond Visual Range (BVR). While the media headlines of 12-0 were hyperbole, they also presented a misleading picture of real combat capabilities. In modern aerial warfare, the aim of a fighter, particularly one like Typhoon, is to engage the enemy aircraft, such as the Su-30MKI, from BVR. Only in rare situations, British experts say, would the two fighters come together for a WVR aerial dogfight. But Air Marshal (retd) Harish Masand, a former fighter pilot who won the Vir Chakra in 1971 War, disagrees. “Anything depending on electronics, whether in WVR or BVR, will always have a countermeasure or a counter-countermeasure. Against an equally matched adversary, one will have to get into close combat if you want air superiority,” Masand said. To draw any conclusion from such exercises is also fraught with danger because most air forces do not use the full extent of their weapons system capability during these engagements, as the intention is to study the opponent’s aircraft, focus on interoperability and learn about their tactics and strategy. The Rules of Engagement and the scenario built for the exercise also determine the number of simulated kills by either side. Unless the details of supporting assets (AWACS, Electronic Warfare platforms, Ground Controlled Interceptors, Radars, Decoys, etc.) used are known, any conclusion drawn will be premature. Again, when it comes to Exercise Indradhanush, the IAF and RAF have a history. 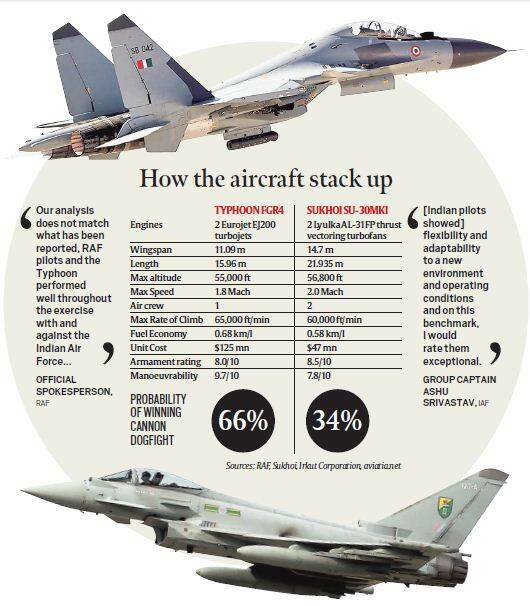 One small point to end: If Exercise Indradhanush indeed shows that the Sukhoi Su-30 MKI is superior to the Typhoon, which finished at the top during technical evaluation of the MMRCA ahead of the second-placed Rafale, why is India buying 36 Rafale fighters? Why not get more Sukhois instead, and save the money and the hassle? Something for the IAF and the Defence Ministry to ponder over!